I wanted to share with you the following CLA Connect Live events planned for February and March. The events are open to current and potential store owners, distributors and manufacturers. 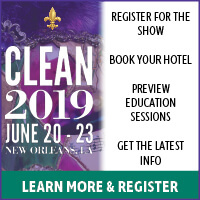 More details and registration is available at CLA Connect LIVE events. February 12 in Kansas City, Mo. February 20 in Burbank, Calif.
February 21 in Seattle, Wash.
February 27 in Raleigh, N.C.
March 5 in North Bethesda, Md. Educational Program: "The Marketing Power Your Laundry Business Needs to Survive and Thrive Online," presented by Dennis Diaz, president, Spynr Inc.
March 6 in King of Prussia, Pa.
March 13 in Wauwatosa, Wis.
March 14 in Chicago, Ill.
Educational Program: "Payment Options: 8 Things You Need to Know," presented by Steve Marcionetti, president, Card Concepts Inc.
March 19 in Flushing, N.Y.
Educational Program: "Evolution of Payments: Cash is No Longer King," presented by John Kelly, director of sales, Setomatic Systems, Inc.
March 20 in Cherry Hill, N.J.
March 26 in West Des Moines, Ia. This is great information, thank you for sharing with the group. If these meetings are coming to a town near you; sign up to attend the event and help encourage your peers to sign up and attend. Look forward to seeing each and everyone of you at an event soon.